Our customers LOVE Afternoon Tea at The Grange! Great venue, fantastic service, friendly and welcoming. Superb afternoon tea. Great charity to support. Awesome volunteers! Will definitely be back soon!” Suzanne on TripAdvisor. …The afternoon tea was beautifully presented and very tasty. I love coming here!” Maddie on TripAdvisor. Perfect! … Service and staff brilliant and the afternoon tea was flawlessly exhibited and exceptionally delectable. Will come again!” Foody on TripAdvisor. Come and try it yourself, or why not treat someone special? Enjoy Classic Afternoon Tea (£12.50), with delicate finger sandwiches, miniature cakes [the mini macaroon is heavenly! ], mini quiche, a freshly-baked cream scone with clotted cream and strawberry jam and a pot of speciality tea of your choice. 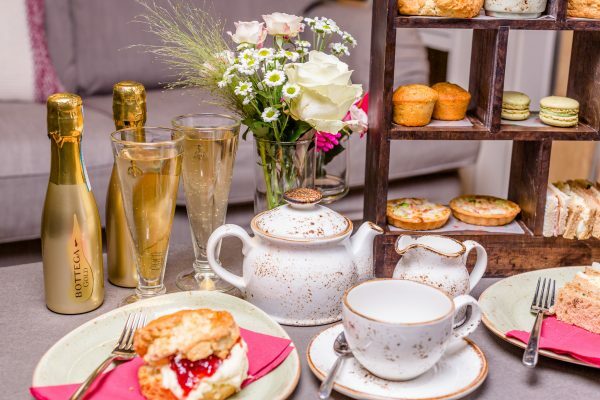 Indulge in Sparkling Afternoon Tea (£19.95), adding a small bottle of delightfully fizzy Prosecco! Or buy a pretty gift voucher to treat a friend or loved one, available to buy in our Gift Shop, or online. Call us on 01844 873500 or email bookings@hearingdogs.org.uk. We look forward to seeing you very soon.